Whatever the true secret to happiness is, it involves music and books. This weeks author does both. I’m having a fight with myself over this answer; I knew this would happen based on the nature of this interview. Okay. At this moment (which is to say that I might change my mind 5 minutes from now), I’d say that everyone should read Contact by Carl Sagan. (Read it; don’t just watch the film.) I think it can appeal even to those who don’t share my sci fi obsession. It’s smart, it’s hopeful, and it should encourage us to support science and unity. And maybe it will make people go check out Sagan’s Cosmos (it’s okay if they take that to mean the TV programme). Which could lead to the more recent Cosmos with Neil deGrasse Tyson. And they’d fall in love with all of creation, get perspective on this “pale blue dot,” and be better people for it. Contact is a gateway book! Before I answer, I want to qualify this by saying that I didn’t have a solid reason to doubt this particular book would be bad. I’ve just had a run of years where I wasn’t really reading fantasy because of a few years just before that where I felt like the fantasy I was reading was the same stories, over and over. But! A friend who keeps my “to be read” pile from getting too small forgot I wasn’t reading fantasy and put City of Stairs by Robert Jackson Bennett in my pile. And it was so fresh and unexpected, with some great twists and turns. If you’re wary of fantasy (or you know you love it) and you haven’t given this a try, it’s the one that made me start trying fantasy again (so that I now have a little list of newer fantasy I love). I’m really bad at favourites, so now is the perfect time to answer this question, as I’ve got only one book published so far. Heh! That said, Peace Fire will always hold a special place for being the first. And for showing me I could finish a book and it could be one that, through the many re-reads necessary to re-write, I could truly enjoy and be proud of. The characters feel like friends, and it’s in this sort of dystopian-ish, cyberpunk, sci fi space I quite enjoy as a reader. (I try not to name drop, so please feel my shame at mentioning this, but this was the only answer than popped into my head.) I’d given up on being a writer. Given in to some stereotypical artist despair. Set it aside for years. I wasn’t going to turn my chunky outline (a 50 page draft, really) of Peace Fire into anything. It was over. (There’s my dramatic side again.) Then my old friend Ernest Cline sent me an ARC for his second book, Armada. I read it immediately, and a twist I anticipated (that didn’t happen, so I could use the idea for myself) got my brain whirring. It was also a reminder that it was possible someone like me could, with some hard work, persistence, and luck, make it. (You might recognise Ernie’s name as the author of Ready Player One, which is the book on which Spielberg’s current project is based.) Suddenly, I was optimistic and excited to write again. It inspired some new ideas and connections for my current series. So, it revived my career and reminded me that reading others’ things (and really drinking in the world) is part of writing. There’s more, but this answer is already long and that’s the spark that set it all off. Again, as I’ve just the one, this is an easy answer for us both. Hurrah! Peace Fire should be available anywhere online (and, if it’s not in your local shop, they should be able to order it through their normal suppliers). It’s the first in a short series, with a sequel in the works, and it feels on the page exactly like one chunk of my creative brain. Also, because I know not everyone loves swearing, and because I have a few of those people in my life, you can look (I think it’s just on Amazon) for Peace Fire: Radio Edit. It’s the same book, but with edits to make the language much less swear-y. Amber Bird is a writer, a rockstar, and a scifi girl. 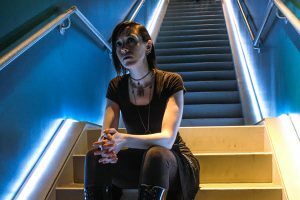 She is the author of the dystopian science fiction book Peace Fire, the front of post-punk/post-glam band Varnish, and an unabashed geek. An autistic introvert who found that music, books, and gaming saved her in many ways throughout her life, she writes (books, poems, lyrics, blogs) and makes music in hopes of adding to someone else’s escape or rescue. And, yes, she was on that Magic card.